The Boston Port Act is an Act of the Parliament of Great Britain (citation 14 Geo. III. c. 19) which became law on March 30, 1774, and is one of the measures (variously called the Intolerable Acts, the Punitive Acts or the Coercive Acts) that were designed to secure Great Britain's jurisdictions over her American dominions. A response to the Boston Tea Party, it outlawed the use of the Port of Boston (by setting up a barricade/blockade) for "landing and discharging, loading or shipping, of goods, wares, and merchandise" until such time as restitution was made to the King's treasury (for customs duty lost) and to the East India Company for damages suffered. In other words, it closed Boston Port to all ships, no matter what business the ship had. 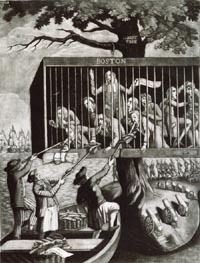 Colonists objected that the Port Act punished all of Boston rather than just the individuals who had destroyed the tea, and that they were being punished without having been given an opportunity to testify in their own defence. As Boston Port was a major source of supplies for the citizens of Massachusetts, sympathetic colonies as far away as South Carolina sent relief supplies to the settlers of Massachusetts Bay. This was the first step in the unification of the thirteen colonies. The First Continental Congress was convened in Philadelphia on September 5, 1774, to coordinate a colonial response to the Port Act and the other Coercive Acts. On this day in 1774, British Parliament passes the Boston Port Act, closing the port of Boston and demanding that the city’s residents pay for the nearly $1 million worth (in today’s money) of tea dumped into Boston Harbor during the “Boston Tea Party” of December 16, 1773. The Boston Port Act was the first and easiest to enforce of four acts that together were known as the Coercive Acts. The other three were a new Quartering Act, the Administration of Justice Act and the Massachusetts Government Act. As part of the Crown’s attempt to intimidate Boston’s increasingly unruly residents, King George III appointed General Thomas Gage, who commanded the British army in North America, as the new governor of Massachusetts. Gage became governor in May 1774, before the Massachusetts Government Act revoked the colony’s 1691 charter and curtailed the powers of the traditional town meeting and colonial council. These moves made it clear to Bostonians that the crown intended to impose martial law. In June, Gage easily sealed the ports of Boston and Charlestown using the formidable British navy, leaving merchants terrified of impending economic disaster. Many merchants wanted to simply pay for the tea and disband the Boston Committee of Correspondence, which had served to organize anti-British protests. The merchants’ attempt at convincing their neighbors to assuage the British failed. A town meeting called to discuss the matter voted them down by a substantial margin.